I spent the past weekend at my parents house for a little vacation from the city. My mom has started a new hobby and from the second I saw all her fun new tools I was hooked. I mean, like I really NEED another hobby or craft to keep me busy. The 500 I already have at home aren’t enough, right? But after I saw what I could make there was no turning back. My mom has taken up jewelry making and sucked me right into her bead world. Now all I can think about is beads and how I can get more and what I can make with them. Trouble for me? I think so. 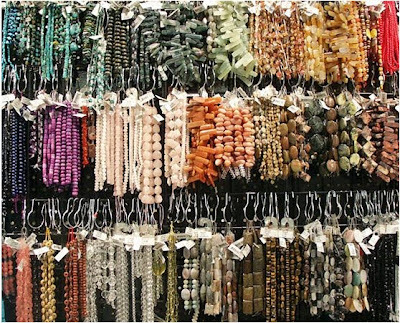 I am a very tactile person and I could spend hours touching all the beads to see how they feel and what sounds they make when I rub my fingers along the strands. So far I haven't made anything crazy just a few simple pieces that not only jazz up my plain Jane outfits but they make the top of my dresser colorful and bright too. I've made a few other things but no pictures of those yet. At the rate I am making everything and buying new beads my jewelry box will soon be completely full. If it gets too full you might find some of these things on my etsy store soon. PS- Can we talk about the major sun damage on my chest- hello freckles! Reminder for all those teenagers out there- the sun catches up to you sooner then you think. I am 28 and those freckles you see are thanks to all that lifeguarding and sun worshiping I thought would make me look tan and pretty. Well sun damage is not pretty- so wear your sunscreen!! I think the coin necklace might be my favorite! I'm more of a visual person. I don't need to touch it- just stare at it and soak it all in. My mom also makes jewelry. Her stuff is beautiful and I help her from time to time... but I'm too clumsy for this hobby! I spend more time picking up the beads I've spilled than actually creating jewelry! She really enjoys it though. Your stuff is looking good! 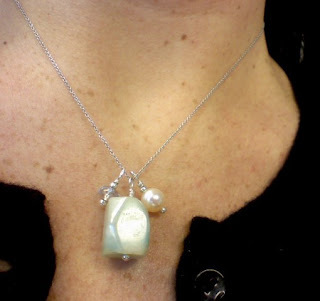 The Amazonite, pearl and crystal necklace is my fave. Have fun!! Love these and I used to do this back in the day. Wish I never stopped. Met a woman once who made the prettiest necklaces for her entire wedding party. I should do that. 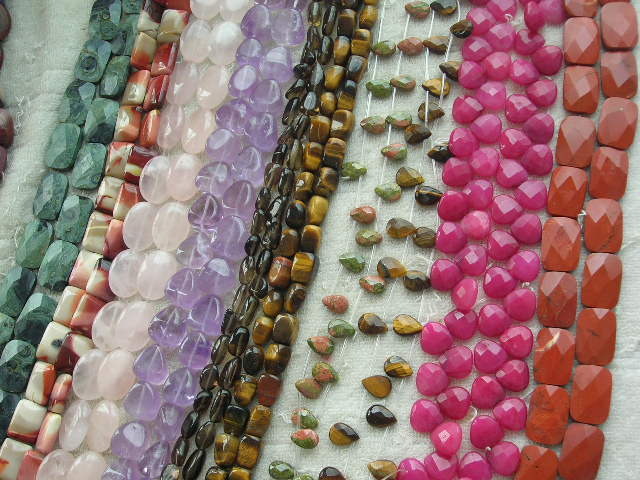 Did you buy the beads wholesale? love that chucky necklace with the big stones you have on! Love that chunky green necklace!! 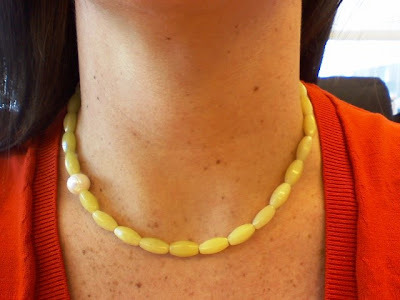 I made necklaces for the girls in my wedding party - freshwater pearls and gold beads. They turned out pretty! But I'm not THAT great at it... a couple of them kind of fell apart after the wedding (oops!). I did manage to fix one and keep it for myself, though. love love love the olive jade one!! So pretty! 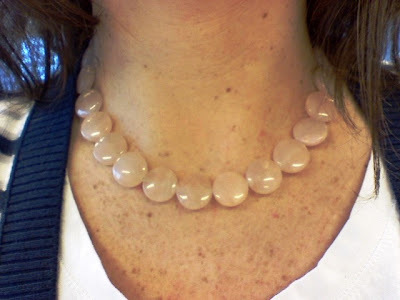 I love the calcite coin necklace. LOVE these. Yes, you def need to add to your Etsy shop! Please do share...an etsy shop would be great! Love the green chunky beads and the more delicate pearl necklace on the chain. Perfect accessories for a variety of outfits! What a fun hobby- I would want to buy soooo much lol. Love the chunky green one! My mom and I make jewelry...there are some great jewelry stores in NYC...I am hooked and we always make some really fun pieces! Those beautiful pieces are what you made your first time out? You definately need to add your new obsession to etsy! I think you are my twin lost at birth. I have been making jewelry for about 6 year now. I have a fabric shopping addiction... i do chairs. I can't really get into my "office" right now because I've got too many hobbies taking up the space. 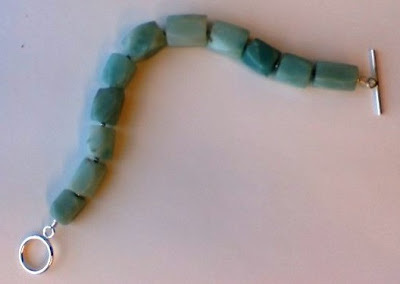 Amazonite is one of my favorite stones!!! I do the same thing-running my fingers over the beads, as well as the yarn and fabric and buttons and scrapbook paper and paint chips. I am resisting the call of the beads, so far it's working, but it's getting harder to resist now that I've seen your pretty bracelet. That chunky green serpentine necklace is so incredible! 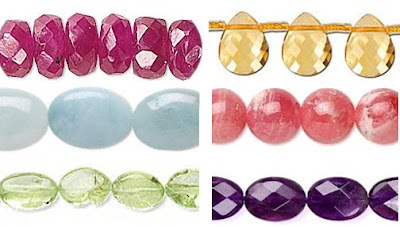 Jealous of this new hobby...I want to make these gorgeous things...where are you buying these fabulous beads!? Love your passion for adding to your creativity! You are always full of good tips! Thanks for the tips about the sun - too. I love the green chunky necklace! That's right up my alley. I think this is a FAB new hobby, I can't wait to see more of your projects! I love jewelry making but I always get frustrated halfway through whatever I'm making :) yours turned out so good! I go on bead binges every so often. I only wish I made as many pieces of jewelry with all the beads I buy. All your creations are beautiful. 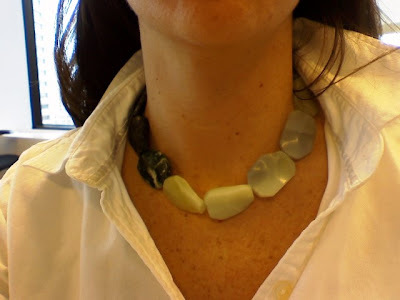 You are a natural jewelry designer too.